The still photographs from the 1969 lunar landing have become part of the collective human memory. Few photos carry the same iconic status as the first pictures of human beings on another celestial object. But few have given any thought to how the astronauts managed to take those beautiful photos with their bulky helmets and gloves. Ever since astronaut Walter Schirra brought along his private Hasselblad 500C on the Mercury 8 mission in 1962, NASA had been working with Hasselblad to make cameras suitable for space missions. It was in fact not until NASA saw the quality of Schirra’s photos, they realized the importance of documenting their missions with photographs. On the Apollo 8 mission, Hasselblad 500 EL electric cameras were used for the first time. This was used on Apollo 9 and 10 too, before two were brought along for the Apollo 11 mission. The 500 EL had an electric motor that wound the film and tensioned the shutter. The camera was supplied with two lenses, a Zeiss Planar ƒ/2.8 / 80 mm normal lens and a Zeiss Sonnar ƒ/5.6 / 250 mm telephoto lens. On Apollo 11 these cameras were used to take pictures from inside the Command/Service Module and the Lunar Module. For the surface shots, however, a special version of the 500 EL was designed – the 500 EL Data Camera. Hasselblad 500 EL Data Camera. Photo by Hasselblad. This camera had to work in the extreme conditions of space, with vacuum and temperatures varying from 120° C in the sun to minus 65° C in shadow. The camera was painted silver to make it more resistant to the variations in temperature. Conventional lubricants had to be eliminated as they would boil off in the vacuum of space. It was fitted with a Zeiss Biogon ƒ/5.6 / 60 mm wide-angle lens and a polarizing filter, which reduces reflections. It also had a glass plate with engraved grid-aligned crosses (Reseau plate) fitted close to the film plane. These crosses was recorded on every photo as a means to measure angular distances between objects in the frame. The same method was used in aerial photography at the time. 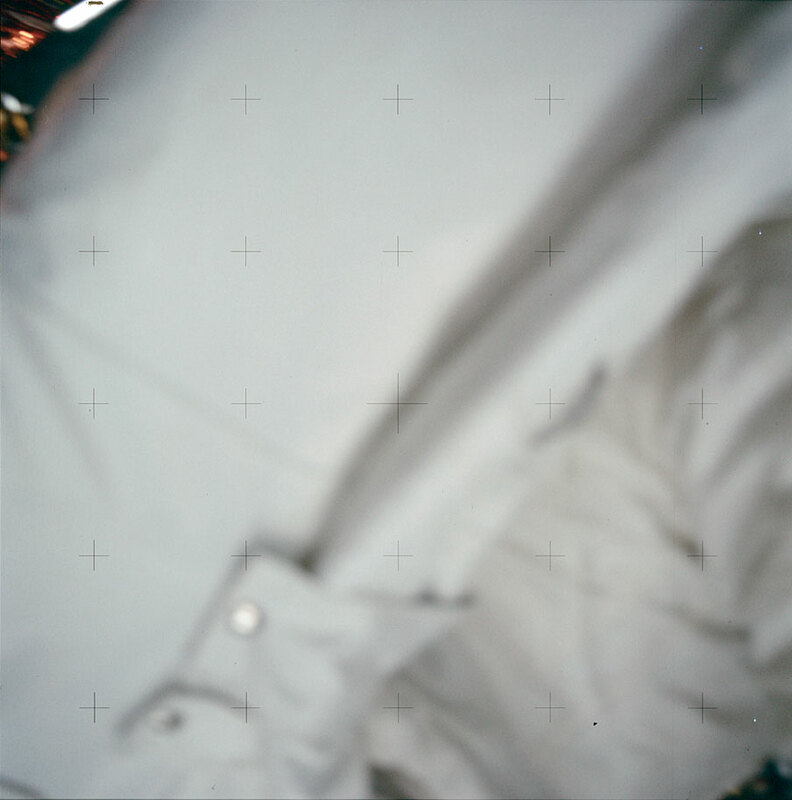 An accidental exposure showing the Reseau plate crosses against a blurry space suit. Photo by NASA. Click for larger version. 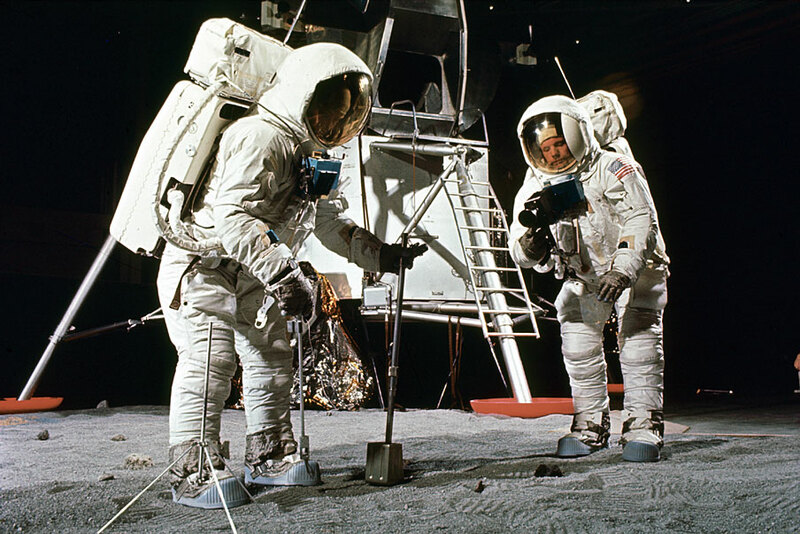 When on the lunar surface, the camera was mounted on a bracket on the chest of the astronaut’s space suit. This both provided some support to the camera, and made it possible to manipulate the rings and levers with both hands. 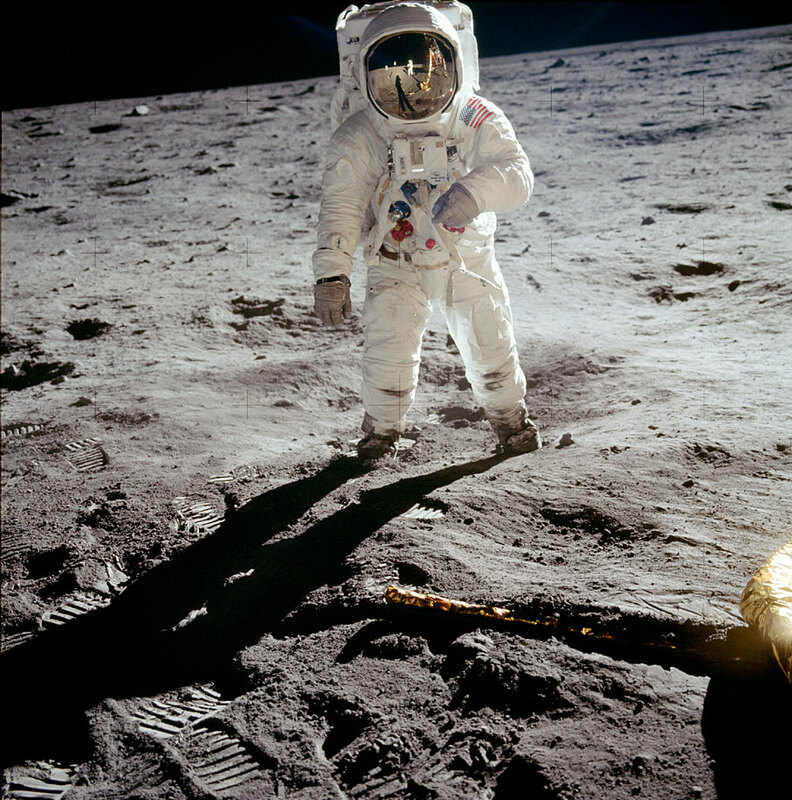 A trigger was fitted under the camera to make it easier to fire (see photo of Aldrin below). All the Hasselblad cameras were medium format cameras, using 70 mm film loaded in magazines. The cameras did not have any light metering or automatic exposure. Based on experimentation on earlier Apollo missions, exposure settings for the different kinds of expected lighting conditions were worked out in advance. The guidelines were printed for the astronauts on the top of the Hasselblad film magazines (shown below). The shutter speed was set to 1/250, and the f-stop recommendations were ƒ/5.6 for objects in shadow and ƒ/11 for objects in the sun. For some of the more important photographs, the astronauts utilized exposure bracketing, varying the exposures one stop up and/or down from the recommended setting, to ensure a good result. Hasselblad film magazine with exposure guidelines. Photo by Eric Long. The focusing system was similar to a lot of consumer compact cameras of the era. The f-stop was kept relatively high (the lowest being ƒ/5.6). Combined with the wide-angle lens (60 mm) this results in a relatively large depth of field (increasing with increasing f-stops). This meant the astronauts only had to get the focusing distance approximately right to get a sharp image. Instead of an infinitely variable focus ring, it was divided into three preset positions: near, medium and far. Although not extremely accurate, it did the job. I have an old Kodak compact camera with this system myself, and it works surprisingly well. The 500 EL Data Cameras did not have a viewfinder, as the astronaut’s helmets restricted movement too much for it to be useful. Instead the lens was fitted with a simple sight that the astronauts used to point the camera in the right direction. This is of course not a very accurate method, so the astronauts were trained in pointing the camera all through the preparations for the mission. They would bring along cameras for simulations, take photographs and review them afterwards. The crew was even encouraged to bring along Hasselblad cameras on private trips to familiarize themselves with the equipment and perfect aiming the camera. 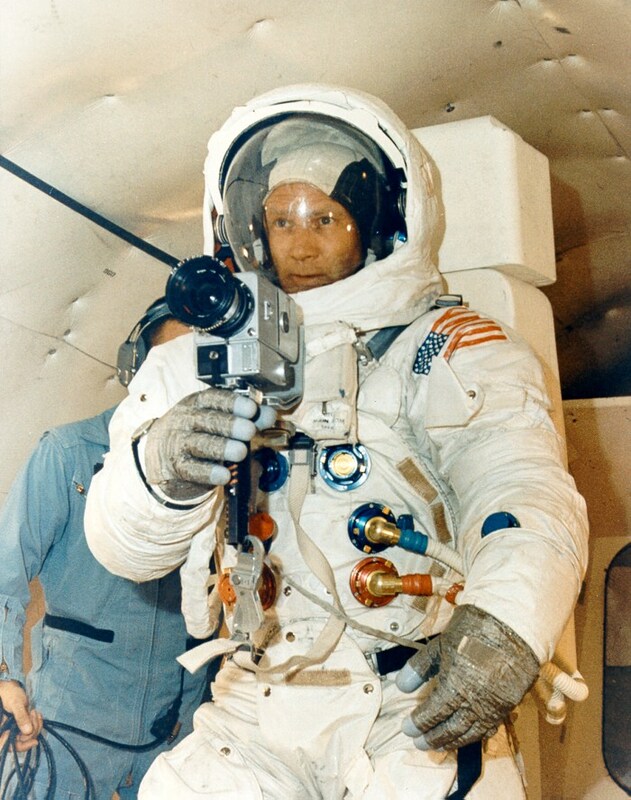 Buzz Aldrin practices aiming his chest-mounted Hasselblad camera. Photo by NASA. Click for larger version. Even though they were trained, the “sight-and-shoot” method of course resulted in a lot of sub-optimal framing. This is apparent in the original, uncropped version of one of the most famous photos from the lunar landing (below). On other, more published versions of this photo, the horizon have been corrected and more black space added above Aldrin’s head (e.g. this version). 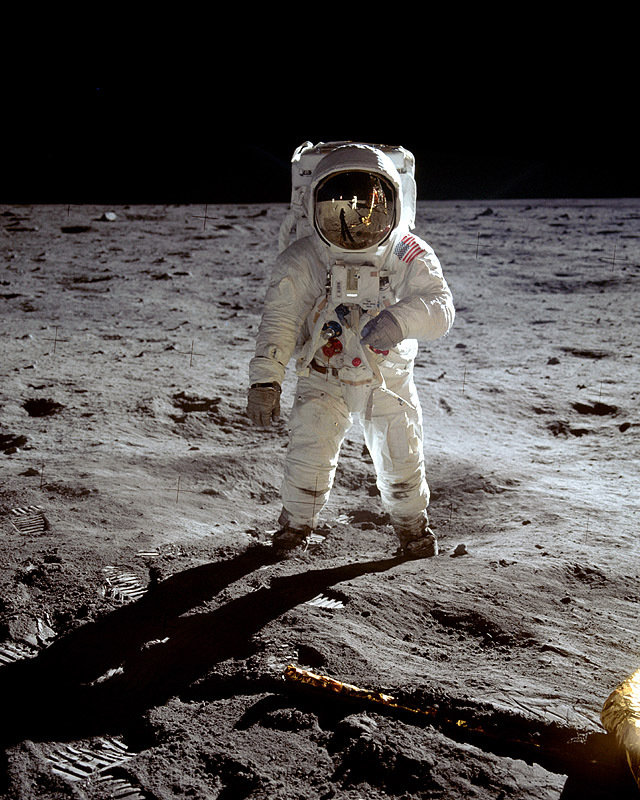 Buzz Aldrin on the Moon. Photo by Neil Armstrong/NASA. Click for larger version. It’s been speculated if it was a deliberate decision by NASA to let Armstrong take most of the photos, and so give Aldrin, forever the second man on the moon, a bigger place in the limelight. Whatever is true, Aldrin himself states that Armstrong simply was a much better photographer than himself. A total of 1407 exposures was made during the Apollo 11 mission, on 9 magazines of film. 857 black & white photos and 550 color photos. Only the film magazines were brought back from the moon. 12 Hasselblad cameras were left behind on the lunar surface during the Apollo program. All photographs related to the Apollo program, from both training and missions, are available with annotations at the Apollo Image Gallery. For more space photos, check out the Great Images in NASA (GRIN) image library. “no big difference between 35mm and 70mm”….really, I beg to differ. Let us forget the difference in format for a minute and just look at the HUGE difference in quality. what type of film did they use that could withstand the high temeperatures and the radiation? According to this NASA article, several different films were used on the Apollo missions: Kodak Panatomic-X fine-grained, 80 ASA, b/w film, Kodak Ektachrome SO-68, Kodak Ektachrome SO-121, and super light-sensitive Kodak 2485, 16,000 ASA film. In a vacuum, things take a long while to get hot or cold. It’s not ‘hot’ on the moon, unless you stay sitting in the sun for many hours. To be even more sure it wasn’t an issue, the cameras were painted with a special reflective silver coating, and had a little extra shielding built in to the film magazines. Also, they were constantly moving around, so the cameras would have been moving into and out of sunlight. The notion that things in a vacuum get hot or cold slowly doesnt gel with the morning sun warming my skin on contact from 90 million miles away..Just a thought. Actually steve, it does (sorry, can’treply to his directly) gel. This doesn’t sound right. Things should heat up more quickly on the moon. All the heat is generated from the conversion of UV into IR. With no atmosphere the moon would have greater energy density reaching the camera compared to one on earth. In terms of heat loss a camera in a vacuum can only lose heat radiatively. There is no conduction or convection occurring. One earth the camera can lose heat through all three methods. So the camera has higher energy input and lower heat output. It will get hotter faster. So how *much* hotter does your arm get, and how deep is the effect? Does it get to ‘film-damaging’ level – on what would you base that call? Would you be concerned about whether a *film canister* (let alone a big solid silvered Hasselblad) was hanging out of your car window for say twenty minutes? How about at very high altitude (which is nearer to the lunar conditions)? How is your arm and the nerve reaction you sense, different from film inside a silver-coated aluminium bodied camera in a vacuum? Answer – in almost every respect..
Have any of you ever done thermal transfer calculations, analysed a situation like this properly, worked out equilibriums, ran tests? Seriously, guys, you come to a topic like this without taking even a few minutes to consider all the issues, and then try to use earthly analogies? Do you think NASA didn’t work through all this, hadn’t had experience with cameras in space, didn’t test these issues out, didn’t do the required heat transfer equations? I’m guessing you guys don’t work in the sciences… If you had, you would be thinking a little more widely and considering all aspects. Want references? You could start by googling ‘Richard Underwood NASA’. My earthly comparison with my arm out a window was to make clear that sunlight does not need to travel through a conductive medium to heat an object it strikes, since it travels 90 million miles through a vacuum to reach earth. Light striking an object within a vacuum will generate heat. l would refer you to the posts above. This may help you confine your reply to the point at hand.l suggest you read down from Chris Mar 17. l am delighted to debate any point, as long as the discussion focuses on such until that point is clarified. Oh to be clear my arm for instance is not receiving the kind of unfiltered radiation that the lunar cameras would have received. So the issue of penetration in comparison to that environment is not a comparison which can be reasonably made and not one l was alluding to in anyway. l think Tony’s Mar 2 comment says is one worth noting. S:My earthly comparison with my arm out a window was to make clear that sunlight does not need to travel through a conductive medium..
*Who said it did? * It’s the NET AMOUNT of heat input that is important, and being completely ignored. S:Light striking an object within a vacuum will generate heat. HOW MUCH? And why have you AGAIN ignored the OPPOSITE effect, namely that the areas of the camera NOT in Sun will be radiating that heat OUT again? That when the astronaut turned, the entire camera would be out of the Sun? Do YOU disagree? You are cherry picking and handwaving. And I would suggest that if you ignore all the issues, you are not serious about this topic at all. Really? And yet you haven’t addressed most of my post at all. Answer the KEY question – NAME ALL of the factors that will affect the heat equilibrium within the camera. ALL of them. Then describe which are most important, why, and how you would calculate and test them. And do explain why NASA’s vast previous experience in space with cameras (inc. the early Apollo missions) would not have been relevant? S:Oh to be clear my arm for instance is not receiving the kind of unfiltered radiation that the lunar cameras would have received. Yet AGAIN you ignored the bit where I suggested you do your test at high altitudes, which is much more like the conditions on the Moon. Are you aware of the difference between sunburn (UV) effects and heat? Why do you think that is also important for this flawed analogy? And AGAIN you ignored NASA’s experience and testing. S:l think Tony’s Mar 2 comment says is one worth noting. The one that starts “This doesn’t sound right”? Oh yes, highly scientific… Well, gee, they were on the Moon, so maybe it *wouldn’t* ‘sound right’. Been in a vacuum to try the old arm-out-the-window-experiment, Tony/Steve? *Being* right is another thing entirely to ‘sounding’ right. It is completely unsupported, ill-considered handwaving for all the reasons above. All the heat is generated from the conversion of UV into IR. Tony (or Steve), would you be kind enough to explain this process of UV converting to IR, and give us a cite? Man your kind of aggressive baiting long winded sarcastic and really quite boring..Maybe that outback sun cooked your fritter. either way your posts need to be shortened down to reflect meaningful content. That should chop them down to DUHHH !! does the sun heat the earth? then it heats the moon. it ALSO heats anyone in a SPACESUIT or ANY OBJECT in space. It is the SUN. There is no immunity to it because a vacuum is around you lol there is no vacuum in your arm or your hammer or your poop. nards lol…. Nice to see there are still some moon hoax suckers out there. They are getting rarer and rarer around the rationality-based boards. Yes, the Sun heats the Earth. But how much? Turns out if you work out the average, the Earth is rather chilly..if I remember correctly, the average is not much above freezing. And it has internal heat as well (largely residual heat of formation, which it is losing over time). In any case, important points is that context matters, and the model has to reflect the actual mechanism. How you heat up if you walk around outside in Arizona during the summer is not how a spacecraft heats up. Conduction/convection is not radiation. And no single temperature describes a dynamic thermal system; go into a cave in Arizona during the summer and measure the air temperature there! Which is in this case a key insight; you don’t get sunburned indoors. Less heat comes through a tinted window. Less heat gets into a car that has those silly-looking reflectors propped up inside the windshield. The trick is basic; cover yourself in highly reflective material. The same aluminized “mylar” appears on emergency blankets and fire fighters, and there’s a good reason for that. The same reason it appears on a great variety of spacecraft and satellites. This isn’t rocket science. Or, rather, the basic principles aren’t. The details, though, are. You wouldn’t wave your hands and say, “That tugboat looks too small to tow a freighter” or “That airplane’s wings look too small to hold it up.” You’d admit you needed to actually do the math. And same for space travel. The principles…ah, the principles work. Because I have hot coffee on the job site. What do I mean? I mean, a thermos bottle works. And it works because it combines vacuum and shiny. Convection is smothered in the vacuum of the double-walled flask, and radiation is stymied by silver paint. The only remainder is conduction at the rim where the inner and outer flask meet. And that’s a long enough reply to a seagull poster. But I do want to mention film cameras weren’t just used on the Moon. The first Hassie flew on a Mercury mission, and was an off-the-shelf model. But lots and lots of film flew on US and Soviet unmanned flights, including deep space probes (they’d shoot film, develop in in the spacecraft, and scan it for transmission). Or the Keyhole spy sats, which shot on film then ejected the magazines, which were captured as they fell in mid-air, by aircraft! I also have to mention once again the sheer brain-numb stupidity of questioning how film would survive your postulated conditions. Film can survive conditions that would make most people very sick if not dead, and it is protected inside a nice magazine inside a camera held by an rather more fragile astronaut. It just goes to show how much you hoaxies are just flailing trying to find any reason to justify your disbelief. “Actually it does” Hmm there’s nothing like an indepth response..When you put your arm out the window of your car in the hot sun it tends to get warm very quickly and that is a response to solar radiation imparting heat, not atmospheric heating because in the shade the temperatures is cooler. So to say that things in a vacuum heat more slowly is a statement devoid of reason. Don’t forget that your arm isn’t covered in heat-reflective silver paint. By this method, the cameras (and the spacecraft for that matter) didn’t absorb as much heat as darker coloured objects (like your arm) would. OK the point we were debating was whether solar energy could be transmitted through a vacuum to create heat. People here are saying a vacuum will cause things to heat more slowly. BTW silver paint is not a magical substance a silver car to the touch in the sun will be almost indistinguishable in temp from any other color. Silver roofing on a hot day could cook an egg. So much for silver paint in my opinion. With respect, Steve, I think you’re wrong about silver coloured objects being almost indistinguishable in temperature from objects of other colours. All objects being heated will reach an equilibrium temperature. In the case of objects in space, the two factors which matter are the distance from the Sun and the colour of the object. In this environment, silver coloured objects have a lower equilibrium temperature than objects of other colours. In the case of the silver coloured Command Module, I understand the equilibrium temperature was somewhere around 10 degrees Celsius. The electronics in the Command Module produced a considerable amount of heat, and this heat was removed from the spacecraft using radiators. However, some of the heat could also be dumped into the cabin to warm it up. By varying the amount of heat dumped into the cabin, the crew could change the cabin temperature. The same rule applied to the cameras used on Apollo – they were coloured silver to reflect most of the radiant heat of the Sun. As for your comment “…to say that things in a vacuum heat more slowly is a statement devoid of reason…” I’d have to disagree with that too. Heat transfer depends on the density of molecules in contact. If you touch a hot cake tin, you’ll burn yourself. If you touch the cake at the same temperature, you’ll feel heat but not get burned. If you put your hand in the oven at the same temperature, you’ll feel heat, but not be affected. As the molecular density decreases, the rate of heat transfer decreases. This is how vacuum flasks keep their contents at their original temperature for as long as they do – there’s little material to transfer heat with. Please disregard my last comment to you it was misdirected. You can only tell half of the radiative thermal properties of an object by merely looking at it, namely, how much incoming solar radiation it absorbs vs reflects. Every surface has another property that you can’t tell just by looking, but is just as important: how easily it radiates its own heat in the far infrared. That’s because the object, being close to room temperature, has a “blackbody” radiation peak at a proportionately longer wavelength, around 10 microns. (Passive IR motion sensors like those used in alarm systems and to trigger automatic lighting work by sensing the longwave IR emitted by your warm body around 10 microns). Spacecraft engineers, including those who modified those Hasselblad cameras for use on the moon, use a variety of surface coatings to control temperatures. One important material consists of a thin layer of Teflon with a rear coating of aluminum. The Teflon is transparent to sunlight and near IR from the sun and the aluminum reflects it, thereby rejecting most of the incoming solar heat. But the Teflon is very “dark” at long IR wavelengths so the surface is very good at radiating its own heat. Anything covered with this material, which is known as “Optical Solar Reflector”, will get very cold in space even in direct sunlight. Other materials are available with the opposite properties. For example, gold absorbs quite a bit of solar radiation but radiates very poorly in the far IR, so it gets very hot in sunlight. So a) you can’t tell just by looking how hot an object will get in space and b) NASA and spacecraft engineers have a LOT of experience in thermal control. How many cameras where left on the moon? Your article says it was 13, but there where 12 moonwalkers, and all other sites says they left behind 12 cameras. I stand corrected. After re-reading my sources I found the same as you. They all agree on 12 cameras. I don’t know where I got that 13th camera from. I strongly believe that there was not an issue with film or the cameras used while taking the photographs of the astronauts. the discussions are irrelevant!!!!! The temperatures varied from 68 degrees to a scorching 72 degrees in the studio in which they were taken. Steve and John, the focus should be on the film used and not the cameras. The crystallization properties of the emulsion in the film in extreme heat and cold as well as the immediacy of the heat and cold transfer. Moving from extreme heat to extreme cold (no matter what kind of “silver paint” you use on the camera) will strongly effect the properties of the film. However, the film was NOT exposed to extreme heat because studio lighting will not effect the film when exposed to it at such lengthy distances from the camera. naysayer, you’re obviously one of these hoax nutters who think the Apollo missions were faked. Back to your Lego blocks little boy. I painted my camera silver then i stuck it in the freezer and chilled it… snapped some shots then into the oven it went… Snapped a few more shots of my kid who was dressed up as an astronaut and let him bounce around on the trampoline… The pictures were awful. Of course I didn’t have all the advanced technology of the 60’s at my disposal. Crazy nuts… Taking a camera to a freezer and to an oven doesn’t help to make good pictures. And the Moon is not a freezer nor an oven. As we all know, (AgBr) is a soft, pale-yellow, water insoluble salt well known (along with other silver halides) for its unusual sensitivity to light. This property has allowed silver halides to become the basis of modern photographic materials. Although the compound can be found in mineral form, AgBr is typically prepared by the reaction of silver nitrate with an alkali bromide, typically potassium bromide. Modern preparation of a simple, light-sensitive surface involves forming an emulsion of silver halide crystals in a gelatine, which is then coated on a film or other support. The crystals are formed by precipitation in a controlled environment to produce small, uniform crystals (typically < 1 μm in diameter and containing ~1012 Ag atoms) called grains. Moreover, my research into this mechanism revealed that the photographic properties of silver halides (in particular AgBr) were a result of deviations from an ideal crystal structure. Factors such as crystal growth, impurities, and surface defects all contribute to affect concentrations of point ionic defects and electronic traps, which subsequently affect the sensitivity to light and allow for the formation of a latent image. These structural compounds are clearly affected by the quick transition from cold to warm climates especially those found on the moon. THUS, the use of photo sensitive materials commonly found in these compounds will not work properly under moon conditions similar to those found in an oven or freezer. SO yes, my experiment is relative to the conversation and so is my PHD in molecular science. Bad news for you, mr. Ph. D. in Molecular Science, your experiment doesn’t represent the Moon – there’s no atmosphere on the Moon. So, when they talk about temperature on the Moon, they are talking about temperature of what? Tip: it’s the surface. That thing under the feet of the astronauts, full of regolith, where the cameras never touched. One more thing, mister “Ph. D.”, in the spaceship the temperature was… dunno, well, supose it was 20 degrees Celsius. The moment Aldrin or Armstrong goes out of the ship, does the temperature drops instantly to -173 degrees Celsius? I think not. The moment the camera gets to get illuminated by sunlight, the temperature rises instantly to +116 degrees Celsius? Again, I think not. Tell me, mr. Ph. D. in Molecular Science, if the camera is in shadow, on the Moon, how fast the temperature will drop, if the initial temperature is 20 degrees Celsius (consider the camera a black body)? And if it is under the Sun (~60 Watts/m², albedo of the camera is very high, ~1 – you know what is it and what it means here, right? ), again on the Moon (no atmosphere) how fast the temperature will rise? If you put the camera in a freezer, that’s another matter: the camera will be in contact with the air (you know, tiny molecules of oxygen, water, carbon dioxid, nitrogen – a said molecules? That’s your field of expertise!) in the freezer, at, say, -5 degrees Celsius – heat transfer is a lot faster than if the interior of the freezer was an almost perfect vacuum, as on the Moon. The same with the oven, “mutatis mutandis”. Finally, considering the low albedo of the Moon, and the low angle of the Sun, and the few hours that the Apollo 11 was on the Moon, what was the temperature of the surface when they landed and when they returned to Earth? Sorry about the bad english. I’m only an electrical engineer. The serious calculations I left as an exercise for the Ph. D. in Molecular Science. The formulae you can find in Halliday and Resnick, “Physics”. Good luck. Is that you again, IDW? Sticking film in an oven. Really. And you pretend to have a PhD in a hard science. How come none of the Hassi’s that were modified by J.A. Maurer Co. (NY, NY) are not mentioned at all??? Either here or on V.H’s site. I worked at JAM for several years, EE; designed the pulse timing circuits for the film magazines. I also assisted testing the new Dupont Cronar ultra thin film base, I and the Opto Eng spent several days at the ’63 World’s Fair shooting pix. In our anxiety to view our pix directly from the final wash, we noticed our hands filling with blood–the thin film base edge was like a barbers straight razor! Speaking of taking the film magazines back: NASA requested, ASAP, ~6 more mags for an upcoming flight-a jeep and a jet were waiting ‘outside’ for delivery ‘yesterday’! My tech and I working around clock delivered. Shortly thereafter, Grissom lands in the Pacific, experiences difficulty opening the hatch and ‘blows’ it off. All 6 mags go to the bottom of the Pacific Ocean! In another incident, during an ‘outside’ walk, the astronaut taking advantage of ‘no’ gravity lets his untethered Hassi float next to himself. He then reaches out for it, overshoots and bumps the camera into Space. Victor H. immediately announce to the world that Hasselblad now has the first camera in Space–he was quite jubilant. John Maurer was the originator of the electrically motion picture, Mitchell followed him with Mitchell Auricon family which still exists. JAM had been supplying the US govmnt with cameras for aerial reconnaissance, photo-mapping and taking pictures of other peoples ‘backyards’. Some of whom ‘shot back’ but not with film! Hi. Thanks for the info, I’m linking to this info in my blog. Up until now I haven’t been able to find the list of available shutter speeds the Hasselblads that went to the moon were capable of. I know that, depending on the lens selected, the F number could be changed and the focus presets, with special paddles optimized for pressure suit gloved hands. But what about shutter speeds? Someone _implied_ somewhere that it was fixed at 1/250, but I can’t remember where. Any hard data on this question? I have not found any specific data on the moon cameras, but they were basically modified Hasselblad 500EL cameras, which again basically is a Hasselblad 500C with an electric motor drive. Both have these available shutter speeds: 1,1/2,1/4, 1/8, 1/15, 1/30, 1/60, 1/125,1/250, 1/500 (Ref: http://www.3106.net/photo/cam1038.htm#ref31). It is my understanding that the shutter speed of the moon cameras was not fixed, but set to 1/250 for the exposure guidelines printed on the magazines (see photo). A camera from the Apollo moon landing was just sold at auction for $760,000. I thought all the cameras were left on the moon? “Conventional lubercants had to be eliminated due the fact they would BOIL off in the temperature of the vacuum of space”. Oil boils but film is OK .
Lol . It’s so fake . Vacuum doesn’t have a temperature. What it does, is lower the boiling point (which is why it is so hard to make soup at extreme altitudes). Objects have temperature . Objects like a camera in sunlight on the surface of the moon have high temperatures . To be pedantic, objects in sunlight will potentially rise to high temperatures. The contribution of the lunar surface, though significant, is not essential to the question. What is, is how that object behaves. And if you are treating a real object, not a hypothetical one, it will not be homogenous. Technically, what is exposed to sunlight is the outer layer of the paint on the camera. The absorption and emissivity of the paint will tell you what equilibrium temperature it will eventually rise to. But that tells you very, very little about what temperature the film inside the camera will rise to. Hey, how come nobody talked about the effects of the Van Allen Radiation belts on the film? If it caused the Astronauts to see stars in their eyes as they traveled through, certainly the film would be ruined. Yeah? Simple answer. Exposed and unexposed film canisters can be put in shielded containers. It’s much harder to put astronauts heads, eyes, and gonads in shielded containers. Plus of course the flashes the astronauts saw were from high-energy cosmic rays, and unrelated to the generally low-energy particles of the VARB. Perhaps more importantly, a flash here and there is not that important (a microscopic streak on film, a blown CCD element, damage to a single biological cell) It it total flux that matters, and the particle radiations that was statistically significant did NOT penetrate the spacecraft so easily. I am an avid photographer and my father was a professional photographer, he is well into his 80s now. Although I have long since transitioned to digital, my film native father is of the opinion that the images from Apollo 11 were shot in a studio. He said that a professional photographer on earth would have struggled to achieve these results. He said that Armstrong producing these shots with a chest mounted camera with the conditions found on the moon is impossible. What conditions? What shots? What he thinks would be the photos produced by a Hasselblad chest mounted by a trained astronaut? He’s at least partly right. It did take professionals, and they struggled. NASA didn’t just pick a camera off the shelf and hand it to an amateur. They calculated, they consulted, they tested. The camera was modified for lunar conditions. The exposure and focus settings were carefully worked out. The astronauts trained with that specific equipment. And when the film came back, some of the best developers in the business worked on those rolls to pull out the best results. John – One example I have tested is the shot of Aldrin descending the LM. You can actually perform this experiment yourself too. The key is to find a material with the same albedo rating to match the lunar surface. As a photographer I’m sure this is second nature for you. Others have attempted to create this (like mythbusters) but their experiment was flawed as they didn’t use the correct albedo!! They are amateurs though. My conclusion is that your father is right….I don’t know if they went to the moon, but the shot of Aldrin descending the LM is unequivocally faked. Apologies English is not my native language. John, research the famous photo of Aldrin descending the LM ladder. This is a proven studio shot. Mythbusters attempted to prove it but altered albedo of their test material. They are very shoddy in their experiments. The test has been recreated by lots of people and even with exceedingly long exposure times it cannot be recreated with one light source. Its easy to test this yourself just obtain a surface material with the same albedo rating as the moon. It’s not a “proven studio shot”. You don’t need to alter the albedo of the material to get reflection of the moon surface, just go outside and look the Moon. The claim that it’s an studio shot, because there’s no reflected light from the surface is ludicrious and you can refute it by walking outside and looking the Moon. I dont even think you understand what you are saying let alone anybody else. “The same albedo rating.” Right. Albedo is a dimensionless ratio (a mathematical description), not a rating. Of course in the real world you have to specify such things as frequency. And neither the Moon as a whole or a patch of lunar soil is a Lambert surface; you have to take anisotropy into account as well. Once again, a hoaxie proves their main skill is parroting poorly-understood claims they heard somewhere else. @Bevan – I tend to agree, my fathers instincts about the moon landings were right on. I never thought about the actual surface of the moon on that photo and how it reflects. Now it seems obvious. I really wanted to believe the moon landings were real, but there is just to much evidence to show they were faked. Its amazing the lengths they will go to to keep lying to people. I found a good series of videos on youtube by Jarrah Whyte. They more or less completely expose NASA and their band of followers for what they are. @bevan, just because you don’t understand don’t mean I don’t understand it. The Moon reflects enought light so the vertical surfaces that are in shadow aren’t completely dark, opposed to the horizontal surfaces in shadow. If you don’t understand it, I can’t do anything about it. But if you don’t believe it, all you need to do is to use a model, just like the people of MythBusters did. They did and proved that the photo don’t need “another light source”, the light reflected by the Moon surface is enought. It’s simple physics. @John Sedgewick, you say a video on youtube? Seriously? By some Jarrah White? The same Jarrah White that, by the sum of US$ 14, will send you a pamphlet that “proves” that PI is 3.146264? The same Jarrah that insists that the Van Allen Belts would be lethal to the astronauts, even against all the evience that it’s not instant death and that you need to stay there for some time? I believe it’s all faked. If you don’t. I dont honestly care. I have no need to convince you or anyone else. Have a nice day. You don’t care for being wrong? I mean, a part of your beliefs is completely false, and it doesn’t bother you? You are currently reading The Apollo 11 Hasselblad Cameras at The Sterile Eye.